The sixth and final episode of The Supersizers Go was dedicated to the Regency period, the time of Jane Austen and the lecherous, gluttonous, foppish, trend-setting Prince Regent, later George IV. Again, Giles and Sue play a well off middle-upper class couple of the day--he is a small landowner with an inheritance of around £50,000--but instead of being married as in other episodes they are brother and sister. This is so that they can portray the difficult state of an unmarried woman (Sue) with not much of her own income. The cold and sometimes horrified expressions on her would-be suitors' faces reacting to her desperate advances seemed a bit too genuine. Here she is trying to hang onto a gentleman. Near the end of the fourth episode of The Supersizers Go in which the food time travellers go to the 1970s, Sue Perkins says that she saw the '70s through the banisters of the staircase, as she and her siblings peered downstairs at the goings on of the adults. This was how I experienced a good chunk of the '70s too. I used to peer through the treads of the very '60s open wooden staircase in the house my parents rented in Wokingham, Berkshire, head upside down, spying on my parents and their guests when they entertained. The third episode of The Supersizers Go was not as interesting to me as the previous two, simply because I knew a lot about how the Victorians ate already. I didn't realize how much I knew until I'd watched the episode, but it's all come down to us via Charles Dickens, Elizabeth Gaskell and other period literature, not to mention Mrs. Beeton or even the American Fanny Farmer. Also, it doesn't look like a whole lot changed between the Victorian era and the Edwardian period, which was covered in Edwardian Supersize Me. Still, those Victorians were sufficiently different from us in their eating habits to seem quite alien, but this was definitely the transitional period between the past and modern times. Asda, a UK supermarket chain (and a wholly owned division of Wal-Mart), spurred no doubt by recent news about scarily rising food prices, has launched an attention grabbing product: the 2 p sausage. You do have to buy it in packs of 8, but a pack is still just 16p. In US cents that's about 4 cents a sausage. The sausages have been reduced, from 56p per package of 8. Even at that price the thought of what might go into such a cheap sausage makes me shudder. At 2p per sausage, it makes my stomach take a queasy flop. Surely there are better ways of eating frugally than stuffing yourself with lumps of dubious chopped up mystery meat? (I love a really good sausage, but bad sausages are a very different matter.) If you're in the UK, have you tried the 2p sausages, or would you consider trying them? Elsewhere in the world, you can have a $175 burger topped with gold leaf and foie gras, which may not even be that good. Something's off kilter somewhere. I was not intending to do a recap of each episode of The Supersizers Go, but they are so interesting and just right up my alley. 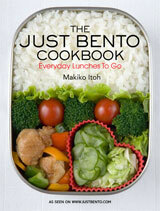 So, if you don't have access to BBC 2, are here for the Japanese recipes, or both, please indulge me. I'll try to be brief. 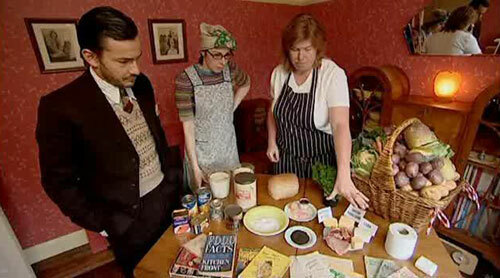 Giles, Sue and Allegra examine a week's worth of rations during WWII. Last year, a very interesting hour-long program(me) called Edwardian Supersize Me aired on BBC Four. Taking their cue from the hit documentary Supersize Me, Giles Coren, food critic for The Times, and writer/actress/comedienne Sue Perkins spent a week eating as the middle-class Edwardians did - meaning a lot. The pair are back, upgraded to BBC Two, in a new multipart series called The Supersizers Go.... The premise is the same as Edwardian Supersize Me - in each show Sue and Giles spend a week eating as people did in a certain historical era. The first episode aired last night, and the era was World War II. In the last few years, there seems to have been a resurgence in the interest in macrobiotics in Japan. At least it does seem so judging from the magazine articles and cookbooks devoted to the subject. If you're unfamiliar with macrobiotics, it's a form of almost-veganism (macrobiotics does allow for some fish) with quite idiosyncratic theories. It originated in Japan, was exported to the West, and gained popularity in some circles, especially the ones devoted to alternative lifestyles (like hippies and such). 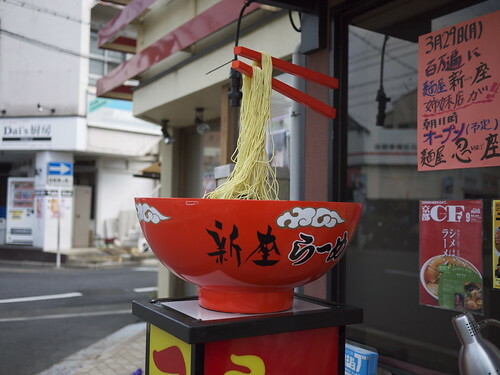 There's a tendency in Japan to get overly impressed by anything (or anyone) in Japanese culture that gets popular in other countries, which I think accounts for at least part of the renewed popularity of macrobiotics - or makurobi as it's abbreviated to - there. The macrobiotic diet has a lot of similarities to the traditional, or pre-WWII, diet, but isn't quite the same. It's also not the same as sho-jin cooking - elegant vegan cuisine that was originated by Zen Buddhist monks. I've been generally trying to increase my repertoire of vegetable and grain based dishes this year (though I'm not a vegetarian), so I've done quite a lot of research into makurobi these past few months. There are plenty of very appetizing looking cookbooks coming out regularly, and I've collected quite a stack of them. Yet it's quite unlikely that I'll be turning into a full-fledged macrobiotic convert any time soon. The main reason is that I can't fully buy into one of the central philosophies of the religion - I mean, theory - that of yin and yang foods. Basically the theory is that all foods have yin (dark or cold) and yang (light or warm) energies, and we are better off eating close to the center of the yin and yang scale. Foods that are at the center are generally things like whole grains, beans and other pulses, root vegetables (but not potatoes), and so on. 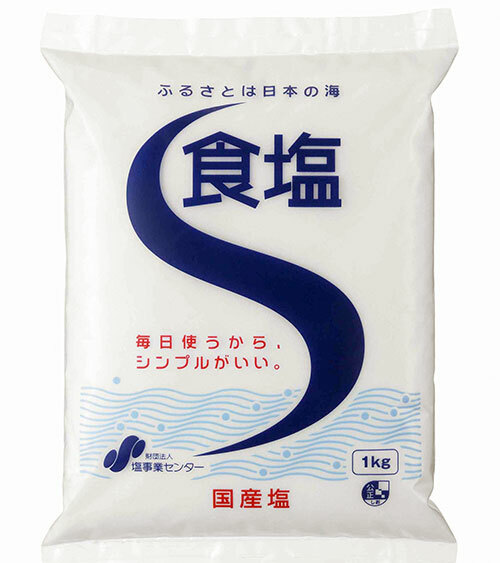 Since macrobiotics did originate in Japan, brown rice is the king of grains.